The saying goes “all dogs go to heaven,” but for many service dogs, their time on Earth is spent helping people who have seen more than the average human being. Such is the case for Army Master Sgt. Leigh Michel and her service dog Lizzy. After almost 29 years in the Army, Michel’s service has taken her across the world, including combat tours to Iraq and Afghanistan. Like many of her comrades, during her time overseas, the chaplain’s assistant saw things that left a lasting impact. “I was in a medical command. Having to see serious injuries and death, that’s when it really started to affect me,” she said. Michel says those close to her began to notice a change in her demeanor, prompting her to begin seeking treatment. 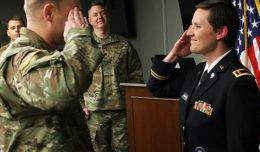 In the Warrior Transition Battalion at Fort Belvoir, Virginia, Michel began working to recover from her invisible wounds, as well as physical injuries to her neck and back. 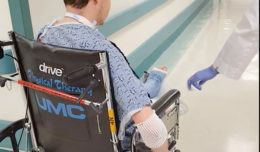 But just before to her arrival, she made an unexpected connection that would change her life for the better. Army Master Sgt. Leigh Michel gets a kiss from her service dog, Lizzy, Oct. 30, 2017. Michel learned of a program called Semper K9, which provides dogs to veterans free of charge. The organization — run by a Marine Corps veteran — takes rescue dogs from shelters and puts them through all of the needed training to prepare them for duty as a service dog. It took Michel some time to find the right four-legged partner, but after working with a few different dogs in training, she came across one that stood out from the pack. “I took Lizzy home one night and it was like instant bonding,” Michel said. After finishing her training, Lizzy, a two-year-old black Labrador retriever, came home to live with Michel for good. “Our bond is ridiculous. She kind of knows what I need before I need it,” she said. Some of those needs include picking things up around the house and bringing things to Michel to aid her mobility issues. “She crawls all the way into the dryer to get clothes out. It’s a big help,” she said. But one of the biggest sources of support comes from Lizzy’s companionship and ability to get Michel to step outside her comfort zone. The duo recently participated in a service dog Olympiad competition put together by Semper K9. The event featured agility courses and competitions to showcase the dogs’ ability to follow commands. Michel says with no prior preparation, Lizzy gave an impressive performance, taking home three awards; first place in the walking course and rocket recall, and second place in retrieval. For Lizzy’s handler, the competition provided an opportunity to get out around other people and face her fear of being in crowds. 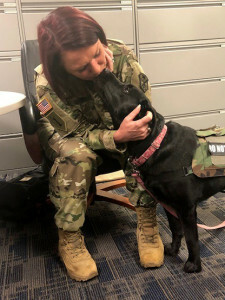 As she continues to develop her bond with Lizzy, Michel said she hopes to see other veterans benefit from the love and assistance of a service dogs. “Having her in my life has been incredible and I hope to see that for other people,” she said.